The silver lining: The popular SweetHearts candy will be available again in 2020. For the first time in 153 years, we'll be celebrating Valentine’s Day without SweetHeart's Conversation Hearts. The New England Confectionery Company (you might be more familiar with "Necco") is no longer producing the classic Valentine's Day candy, which means you'll need to find another way to send sweet messages to your loved ones this year. SweetHearts first began making conversation hearts in 1866. The operation was taken over by Necco in 1901 and since then they've become the most popular Valentine's Day candy in 21 states. Last year, CandyStore.com reported that SweetHearts Conversation Hearts were the most popular Valentine’s Day candy in America. So what happened? Because of the time it takes to create the supply of conversation hearts, Spangler Candy Company didn't have enough time to make the hearts for 2019. 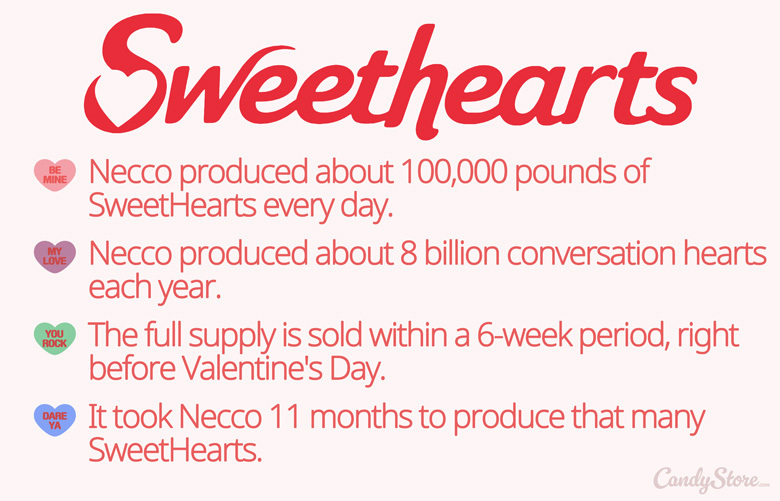 It took Necco 11 months to produce eight billion conversation hearts—all of which would be sold in the six weeks leading up to Valentine’s Day. This post originally appeared on Better Homes & Gardens by Emily VanSchmus.